Among the noted artists and newspaper men who have been subjects of sketches in our reviews, Charles W. Saalburg, of The Inter Ocean, holds a high place. As an artist he possesses true genius and his productions ever show originality in subject and careful, painstaking and finished work in execution. Few readers who take up The Inter Ocean and catch some story of the day by a glance at one of its color cartoons can realize how difficult and laborious it is to produce the picture in a form so complete that it attracts the eye, impresses the mind and without explanation has often a more impressive effect than a long written article dealing with the same subject would have. First the artist must get his idea, or originate his design; then he must sketch it, then make a finished drawing, which for the color process has to be duplicated several times, and even with the best artistic work results are not always perfect, inasmuch for daily newspaper work the process has to be quick and the paper used to print upon is not necessarily of the finest quality. Improvement in the character of The Inter Ocean art work since Mr. Saalburg took charge of the color supplement has been marked and has had much to do with the accelerated popularity of the paper of late with the reading public. Saalburg’s facility for doing local or detail work, such as sketching faces and individuals and getting and presenting their characteristics in a striking manner as well as for scenes and events of importance caught on the wing, as it were, are unsurpassed by any artist of his years. But it is in cartoon work of a political and satirical nature as well as lampooning of fads, crankisms and vagaries that his best powers come into play. In this line of work he has already made his mark and is no longer regarded as one of the rising lights but a finished artist in an almost distinctively modern school, which preserves all the best features that made Cruikshank, Dore, Nast and Keppler marvels and celebrities in their day. Of a nervous temperament and modest, retiring and gentle disposition, this talented young artist is favored with many warm friends and admirers who enjoy his work, take pleasure in his success and are confident of his brilliant future. Mr. Saalburg was born in San Francisco, and has but just passed his twenty-fifth year. Hi father is well known in business circles in the Golden Gate City, and as a side issue he has conducted the San Francisco Weekly Times since 1856. Young Saalburg early developed the artistic instinct, frequently getting into trouble for making caricatures on the public school blackboard of his teachers and most grave and reverend school officials. His ambition when he reached his sixteenth year was to become a color artist, and his parents, either to develop his talent in a practical manner or to discourage his ambitions entirely in the artistic line, had him apprenticed to a lithographer who immediately set him to work putting the color on maps. This, it must be confessed, was not an incentive to budding genius of his sort. He was faithful and did his work well, but never became satisfied with lithography, as it was too mechanical, and many of the stories turned out by him had funny cartoons about the edges, and when Christmas time came around his productions ran to representations of pudgy and kindly-looking old St. Nick, and pretty little girls carrying stockings which bulged out with a surfeit of treasures. Tiring of this work he packed his grip and left the glorious climate of the slope, going to New York, where he entered the employ of Sackett, Willhelms & Betzig, the present printers of Judge, and there he had a period of valuable experience in colorwork. He was next employed with the firm of Julius Bieu & Co., where he had a thorough course of training in colorwork and lithographing. 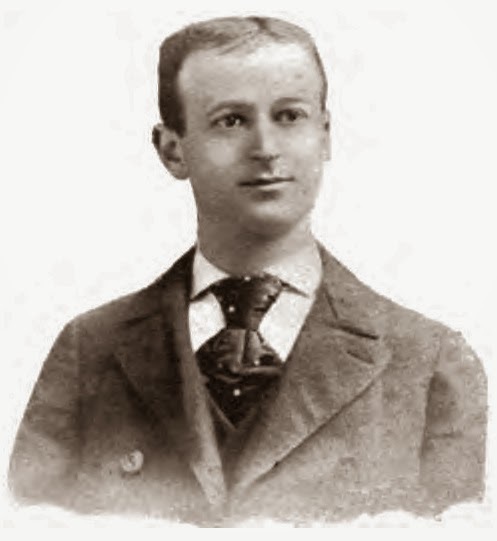 Being desirous of studying methods in various establishments and of gaining versatility by travel and observation he went to Springfield, Massachusetts; to Hartford, Connecticut; Boston, Philadelphia, and St. Louis, and thence back home to the Pacific Coast, where, when in his twentieth year, he began to make the colored cartoons for the San Francisco Wasp. His work on this publication attracted national attention, and so popular was it locally that during the last presidential campaign he was engaged to do political cartoon work for the Examiner and his productions were largely copied by the eastern press and magazines. Becoming seized with the desire to see the World's Fair and to extend his knowledge of art work he, in company with W. W. Denslow, the talented sketch artist now employed by the Chicago Herald, started East by way of Vancouver and British Columbia, going as far north as Winnipeg, the two artists making sketches for future use of scenes and characters coming under their trained observation. Upon arrival in Chicago early last year the two companions opened a studio in the Evening Post building, and their orders for work immediately gave them plenty of hard work to do. Saalburg’s attention was struck by the colorwork done by The Inter Ocean multicolor press, which, by the way, is a peculiar one, being a marvel of rapid-working mechanism and which prints four colors at one impression, and while the speed required by a newspaper of large circulation makes it difficult to procure finished results Saalburg’s practical training led him to believe that there were great possibilities in The Inter Ocean process and that the result could be greatly improved upon. He called on Mr. H.H. Kohlsaat and was soon given full charge of the colored supplement of the paper. His cartoons have been marked features of the improved Inter Ocean under Mr. Kohlsaat’s management. Some examples of his work may well be called masterpieces—such as the “Vanishing City,” a full-page cartoon illustrative of the passing of the World’s Fair, for which there was an unprecedented demand and which exhausted several editions. Another catching cartoon was entitled “Before and After,” being a contrast between Father Knickerbocker and the “I Will” young woman typical of Chicago, and still another striking and popular piece of work was “Get Off the Earth,” a cartoon depicting a fat and frisky Chicago porker kicking the Tammany tiger off the face of the globe. While fidelity to detail is a distinctive feature of Saalburg’s productions his best efforts also disclose marked and distinct originality—qualifications which are possessed only by work produced under the inspiration of true and inherent artistic instinct. As an experiment he is now attempting the production of half-tone work in colors by the chromatic process, and if the departure proves a success, considering the methods and materials employed, he will have added another triumph to his credit. Saalburg’s work shows continuous improvement, and he is an indefatigable worker. Just at present his puzzle faces are creating a great furore among Inter Ocean readers. Altogether, for so young an artist, the career of Mr. Saalburg has been brilliant, and his future promises to redound with success and honors.